You will find below Fr. Bill’s homily from last Sunday. Requested by several parishioners, it is a beautiful reflection for the beginning of Lent. In the Gospel story the scribes, the religious professionals, argue about Jesus’ claim to forgive sins. For us, the issue may be “forgiveness of sin” itself. What is meant by it? Who needs it? It is not a secondary, a peripheral issue. It is pretty central in the Bible, and in church life. We cannot do without it. It is really more than letting bygones be bygones; it is more than being excused from a wrong move here and a stupid action there; it may even be more than finding relief from a bad conscience. Forgiveness of sin is “bigger” than all that. The incident following the argument with the scribes may be helpful: Jesus heals the paralytic. 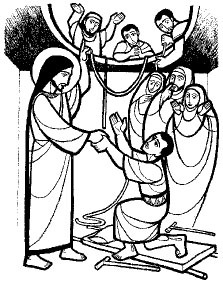 Jesus makes the paralytic get up again; he puts him on his feet, and enables him to face the future. I think that is a good illustration of what forgiveness of sin is. The condition of the paralytic may serve as an image of our sinfulness – you and I, we are all created in God’s image and likeness. That is our vocation, our calling; it is God’s dream with us. But we have great difficulty making that true. We are pretty good in messing up that vocation, that dream of God about us. We fail in becoming what God wants us to be. It seems to me it is all captured in the first three chapters of the Book of Genesis. First, there is the Creation Story which has God speak about his dream to create us in his image and likeness. But that story is immediately followed by the story of the fall of Adam and Eve where we mess up God’s dream; messing up God’s dream with us is really our sinfulness. We fail in what God wants with us. We show that failure, that inability in our half-hearted response to the many challenges that life offers us: in our neglect or even at times our outright hostility towards others that are part of our world; in our cruelties and lack of love; in our inability to forgive, in our propensity to hold grudges, to seek revenge; in our various kinds of violence and wars. That is really our paralysis, our sinfulness. It is from that paralysis that Jesus, on behalf of God, heals us. It is an act of liberation, indeed a new creation. In Jesus, the compassionate and gracious God applies to us his unimaginable creativity, that “new thing” that the first reading speaks about. God transforms us into men and women who radiate in turn God’s compassion and kindness. God’s forgiveness makes the paralytic get up and walk again; it makes the dead live. Indeed, raising the dead to life and forgiving sins are pretty much the same, God’s act of re-creating us. Whatever is sterile and barren will bear fruit. In that light the psalm refrain “Lord, heal my soul, for I have sinned against you” makes a lot of sense. That line is not an accusation, it is not a downer. It is our way of laying before God our paralysis, our impotence, our hostility. We are ready and receptive for the deed of God’s forgiveness, ready and receptive for God’s “Yes” (which is really Jesus Christ) to us (2nd reading), open and ready to enter the space of God’s forgiveness, God’s new world.